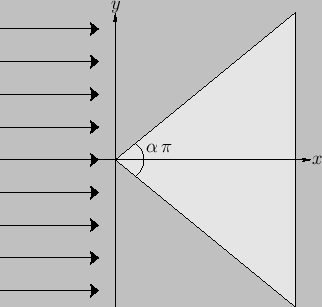 Consider the situation, illustrated in Figure 5.10, in which incompressible irrotational flow is incident on a impenetrable rigid wedge whose apex subtends an angle . Let the cross-section of the wedge in the - plane be both -independent and symmetric about the -axis. Furthermore, let the apex of the wedge lie at . Finally, let the upstream flow a large distance from the wedge be parallel to the -axis. Figure 5.10: Inviscid flow past a wedge. where . Note that the tangential velocity is zero at the apex of the wedge. Because the normal velocity is also zero at this point, we conclude that the apex is a stagnation point of the flow. Figure 5.11 shows the streamlines of the flow for the case . 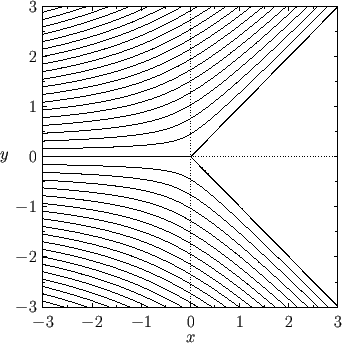 Figure: Streamlines of inviscid incompressible irrotational flow past a wedge.